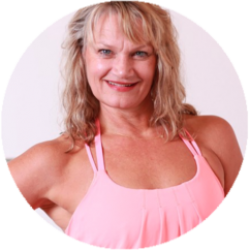 Helen Vanderburg, BPE, Exercise Physiology, is the co-owner of Heavens fitness, yoga and spin studio, Fusion Fitness Training™, author of Fusion Workouts and Commercial Fitness Education Manager for Balanced Body. She has been recognized numerous times as Canada’s Presenter of the Year by CanFitPro and is the recipient of the 2018 Lifetime Achievement Award for her dedication, leadership and innovation worldwide. She has been awarded the IDEA Program Director, Presenter of the Year and the 2018 Top Industry Contributor. Recognized as a Women of Vision and one of Canada’s most influential people. Recipient of many industry awards and is an elite athlete as a World Champion synchronized swimmer and inductee to the Canadian and International Sports Hall of Fame.